GestureTek’s Illuminate Kiosk display is an interactive kiosk system that uses patented gesture recognition technology and a motion control interface to give users both point based, touch free computer control and touchscreen kiosk interaction. All kiosk technology, including computer, camera and other components, are completely hidden from view within the sleek and contemporary kiosk display hardware. The only visible element is the dynamic interactive multi-media projection images that appear to be floating in mid-air when projected onto a glass panel with a thin projection film applied. GestureTek’s patented hand tracking technology detects the user’s hand movement near the interactive kiosk, providing a gesture control interface that replaces a mouse, touchscreen, joystick or other peripheral device. Hand motion is the only input device required, so the user can control the interactive experience with simple hand gestures and point motion. 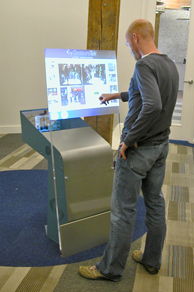 The portable motion sensing interactive kiosk surface computer from GestureTek is used worldwide for entertainment, edutainment and corporate presentations in trade show exhibits, museum and science center installations, retail point of sale terminals and in corporate lobbies and foyers as wayfinding systems. Looking for a multi-touch solution? View Illuminate Interactive Display and Kiosk brochure. View Illuminate Surface System Showcase video.